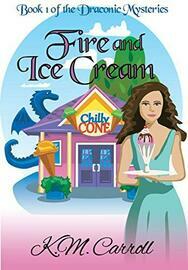 But when her manager is found dead with a bowl of Tianna's Rocky Road ice cream beside her, Tianna springs into action. With a knack for observation and her enhanced drake hearing, she delves into her manager's smoky draconic past. Aided by a secretive drake, a single mother, and a four-year-old dragon shifter, Tianna must unravel the web of lies that surround this dragonic death ... or there may be more fire than ice cream.